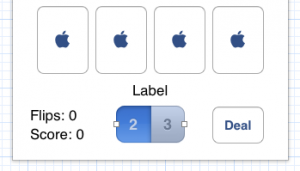 Drag out a switch (UISwitch) or a segmented control (UISegmentedControl) into your View somewhere which controls whether the game matches two cards at a time or three cards at a time (i.e. it sets “2-card-match mode” vs. “3-card-match mode”). Give the user appropriate points depending on how difficult the match is to accomplish. flipCardAtIndex: needs adjustment to cope with both (or more) modes. First create two arrays by looping over all cards to see witch one is face up. At the end one array will hold those cards, the other one will contain their contents which is used to generate the text messages. Any clue or help you can provide would be awesome. BTW, your blog is so helpful, I couldn’t have made it through the assignment with out it. I am now able to understand everything that was needed to do this assignment. I am taking the class through iTunes U only. Could you upload your code to github? Could it be you are using Xcode 4.5.2? I am using XCode Version 4.6 (4H127). self.cardModeChanged is being called before the game object is completed. My only issue now is I don’t understand why it worked for you without that change. Perhaps my understanding of the “rules” is incorrect, but I don’t think this should be a match. I thought that all 3 cards needed to have either the same suit or the same rank? Thanks for providing these code samples, they’re really helping me out.